We give a counterexample to a trilinear version of the operator space Grothendieck theorem. In particular, we show that for trilinear forms on ℓ∞, the ratio of the symmetrized completely bounded norm and the jointly completely bounded norm is in general unbounded. The proof is based on a non-commutative version of the generalized von Neumann inequality from additive combinatorics. Briët, J, & Palazuelos, C. (2018). 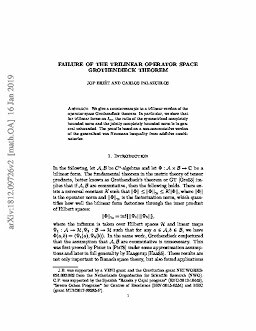 Failure of the trilinear operator space Grothendieck inequality,. arXiv.org e-Print archive.